Web based software makes your designs accessible anywhere, any time, on any computer. New features released regularly and are immediately and automatically available to use. Extensive tutorials as well as demonstration videos available. Benefit from automated user inputs such as ruling span calculations, sag-tension measurements, and stringing tables. Create and reuse design templates to your exact requirements. Eliminate repetitions and increase accuracy as input data is updated live. Launch into design with a rich set of intuitive line and terrain modelling tools. Cut down on design time with an in-built conductor wire, pole, and pole-top construction library. Edit and create pole top constructions with ease. Build and update designs from existing data resources: GIS, survey data and plans, contour plots, engineering reports, maps, libraries, and more. Import a variety of file formats, including DXF, CSV, PDF, MapInfo, and SHP. Model using LiDAR point clouds - more than 100 million points supported in the cloud or by connecting to your data. Perform 3D inter-circuit and obstruction clearance measurements, from buildings, to fences to trees, in a matter of clicks. 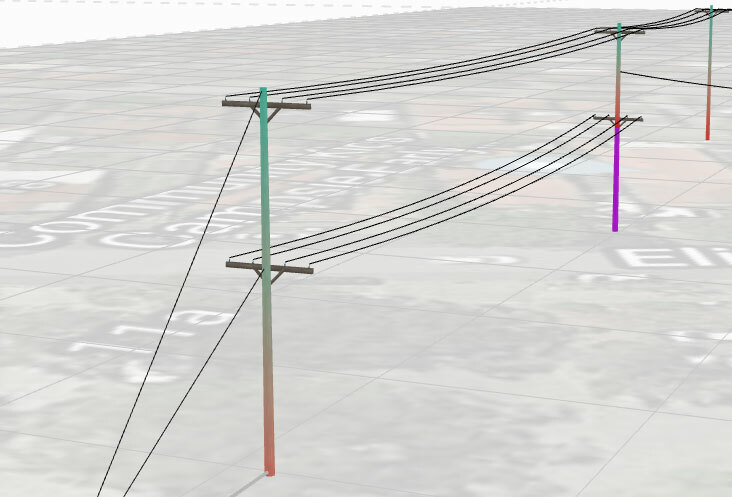 Sort out line-to-pole and line-to-obstruction clearance measurements, and benefit from real-time point cloud clearance checks. Take care of ground clearance measurements easily and intuitively. Problem-solve in the cloud with foundational analysis and structural analysis of conductors, poles, construction components. Eliminate guesswork and repetition with multiple profile views from a single 3D model and multi-pole limit state overview. Calculate and report in detail all the forces and bending moments on crossarms, braces, insulators and more. Import manufacturer data for your components including pass/fail criteria. Share a link to your designs to give clients and utilities the bigger picture, along with options showing different benefits and limitations. Export a variety of reports, from integrated design-wide validation reports to profile, plan view, and tip load reports. Export to AutoCAD DXF and PDF formats so you can adapt flexibly to client and utility workflows.